A Little Bit etc. : Glowing Skin Giveaway! 3. Leave a comment below this post letting me know what your current favorite "glow getting" product is that you use. Please be sure to include you twitter handle for reference. 5. The contest ends May 21st and the winner will be announced on my blog on May 22nd, so be sure to check back. Items featured have been graciously provided by each brand. Giveaway open to US residents only, and the winner will be selected at random. Lost, damaged or stolen prize items cannot be replaced. Good Luck! My favorite "glow getting" product is from Korres. It is their Wild Rose + Vitamin C advanced brightening sleeping facial. I apply it 4-7x a week at night. I wake up and wash my face and my face is brighter and more radiant. I can't live without it. My favorite products are from the Body Shop: vitamin c skin booster and the daily moisturizer with SPF 30! What an awesome giveaway! Who doesn't need more glowing radiant skin to take them into the summer? I've been using the Korres Pomegranate Deep Cleansing Scrub for it...perfect! My current go-to glow-getter product is the Alba Botanica Good & Clean Pore Purifying Mini Peel. So good for $7! My current go-to glow-getter is the Alba Botcanica Good & clean Pore Purifying Mini Peel. So good for $7! I have found Armani Fluid Sheers work really well, but Revlon Skinlights are just as good! Skincare wise the new Olay skin serum with glycolic acid is my go to at night and Dr. Perricone is something I want to obtain. @sproch66 prochsherry@yahoo.com. Fingers crossed!!! My Favorite Glowing getting product has to the L'Oreal Magic Lumi Primer, I sometimes mix it in with my foundation and sometimes I put it where I want to have that glow from within look on my face. Follow on Twitter (@jubycuty07) and liked on Facebook. Email is jessicanruby@gmail.com. Really into Lush's BB Seaweed mask these days -- the perfect combination of gentle physical exfoliation with lots of soothing moisture. And artificial glow? Josie Maran's Illuminzer + a little bit of Benefit's High Beam above my cheekbones. I've been loving Lush's Brazened Honey mask and it smells amazing but my old faithful is Origins Charcoal mask! I follow you on twitter (@sashapagni), facebook, and instagram! I love La Praire's gold illuminating primer. My current favorite is the Skyn Iceland Fresh Start Mask. Love the cooling sensation and leaves me super refreshed and glowy! glow are sk II sheet masks. @bybare . i follow you on GB as stephanee mullins. Thanks! My skincare routine is in SERIOUS need of a revamp. I'm still using my winter oils/lotions! Lately I am loving Glamglow's mud mask and FAB's radiance pads! Hi! My favorite get-glowing product is Paula'sChoice Resist Intensive Wrinkle-Repair Retinol Serum. Enjoy! My favorite glow getting product(s) I've been using has been a mix of Watt's Up by Benefit topped with theBalm Mary Lou Manizer on top of my cheek bones & down the bridge of my nose because it's been the perfect combo to use this time of year. Following you on twitter and Facebook already. My current favorite is John Masters tea tree and rose hydration serum! Tarte Pure Maracuja Oil! But this was SO hard to choose hahaha. 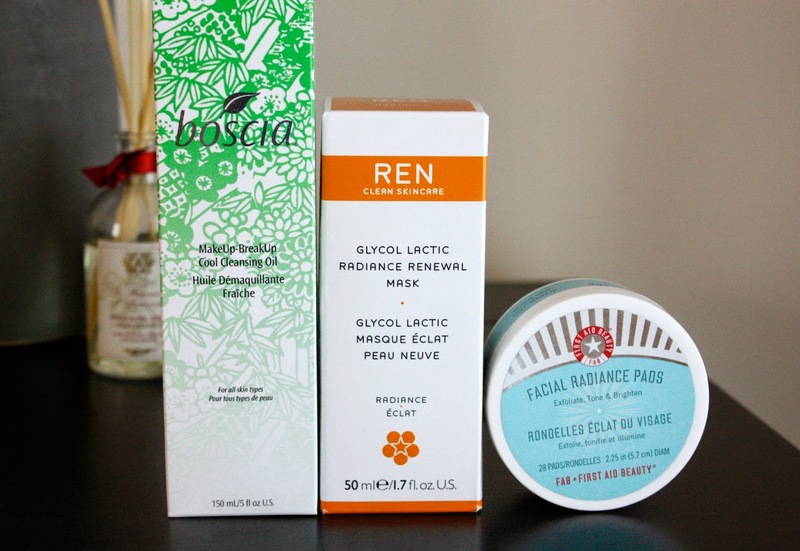 There's too many - including the Ren Glycol Lactic Radiance Renewal Mask! My favorite mask right now is Perricone MD Cloro Plasma! It looks white in the jar, but once you rub on your skin, it turns a fun green color! After I wash it off, my skin is so glowy and dewy and pretty! Thank you for bringing a great giveaway!! I'm following you on twitter, facebook and have subscribed to your blog via RSS feed! Can't get enough of the SASS and great advice!!! LOL! I get my glow on with Kate Sommerville's ExfoliKATE! LOVE THE STUFF!!! My favorite is GlamGlow! It makes my skin looks brand new!